A DMZ tour from North Korea will show you the DPRK's perspective on the Korean War. As you probably know the North Korean version of the War is different to that in the West. The DMZ guide/soldier will take you to a museum explaining the North's view on the War, life after the War, their views on the US and on re-unification on the Korean peninsula. Pictures of Kim Il Sung can be seen in the picture above. As you enter the small museum a red sign in Korean reading that the museum has been graced by the presence of Kim Jong Il. 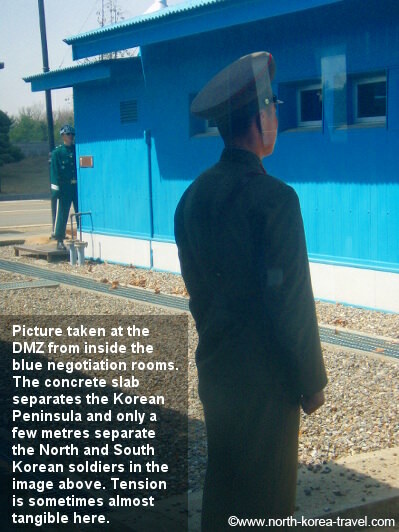 Please click here to go back and see more scenes of a regular DMZ tour in North Korea.